AS CREWS began removing bodies from beneath a collapsed pedestrian bridge Saturday, a victim's uncle raged against what he called the "complete incompetence" and "colossal failure" that allowed people to drive beneath the unfinished concrete span. "Why did they had to build this monstrosity in the first place to get children across the street?" 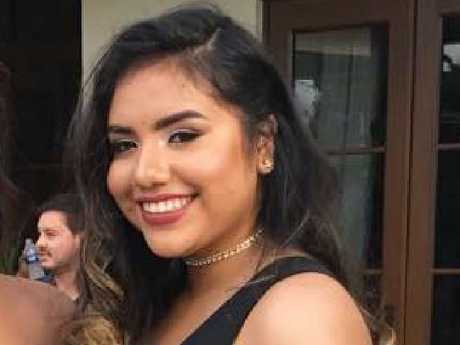 said an anguished Joe Smitha, whose niece, Alexa Duran, was crushed in Thursday's collapse at Florida International University. "Then they decided to stress test this bridge while traffic was running underneath it?" 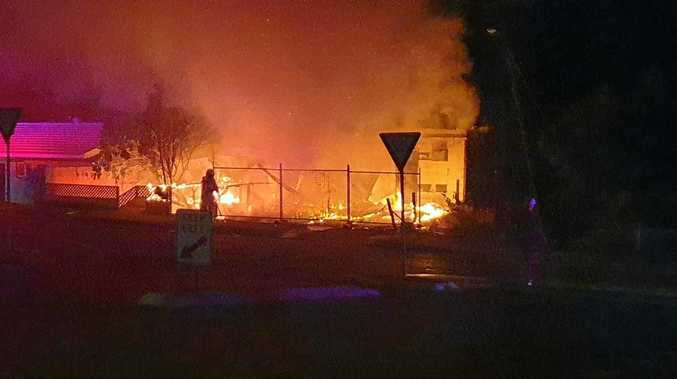 Authorities say at least six people were killed when the structure fell onto a busy six-lane road connecting the campus to the community of Sweetwater. Crews removed two cars containing three bodies Saturday, but officials said there were still at least two more victims beneath the rubble. Rolando Fraga Hernandez and his gold Jeep Cherokee were pulled from the wreckage Saturday. Later that morning, the bodies of Oswald Gonzalez, 57, and Alberto Arias, 54, were found inside a white Chevy truck. Amjad Aref, a professor with the University of Buffalo's Institute of Bridge Engineering, said they should have been "a big red flag." "Bridges are really very vulnerable when they are under construction, when there are just pieces," he said. "It's like still a flimsy structure. And when you see cracks, somebody has to raise really a big flag and say, 'We need to do something. We need to figure out what's happening quickly and do any mitigating actions to prevent further progression of damage and ultimately collapse,' as we saw here." But Ralph Verrastro, principle of Naples-based Bridging Solutions, was not surprised to hear about cracks, and said it was not necessarily a problem. "Any bridge with concrete, that's made of concrete, there's always cracks," said Verrastro, who has been an engineer for 42 years. "If they had concerns that something was going on for that main span, then they would have called the sheriff or the police and closed the road. I would be very surprised if it's determined that they were taking a chance and trying to do something under traffic. It's just, as bridge engineers, that's just never done." Two days before the collapse, an engineer with the design firm left a voicemail to say some cracking had been found at one end of the concrete span, but the voicemail wasn't picked up until after the collapse, Florida Department of Transportation officials said Friday. In a transcript released Friday night, Denney Pate with FIGG Bridge Group said the cracking would need repairs but the company didn't think it was a safety issue. 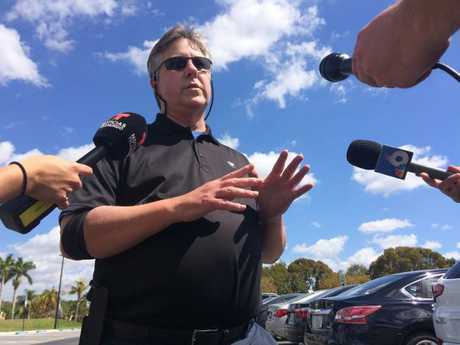 In a statement Saturday, university officials said representatives of FIU and DOT met with a FIGG engineer for two hours Thursday morning to discuss the cracking, and determined there wasn't a safety issue. The bridge fell soon afterwards. 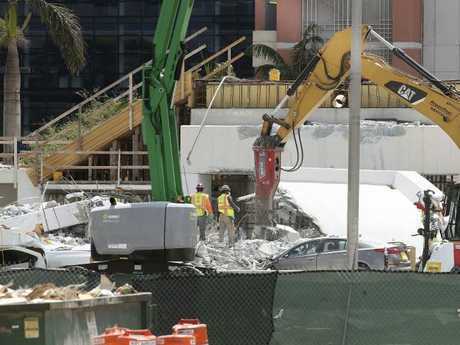 "The FIGG engineer of record delivered a technical presentation regarding the crack and concluded that there were no safety concerns and the crack did not compromise the structural integrity of the bridge," FIU said. NTSB officials have said it's too early to say whether any cracking contributed to the collapse. In a news release late Friday, FIGG Bridge Engineers said it "continues to work diligently" to determine the cause of the collapse, and is examining the steps its team has taken. It added, "The evaluation was based on the best available information at that time and indicated that there were no safety issues." It also asked for time to accurately determine what led to the accident. Scheduled to open in 2019, the bridge was to provide safe passage over a canal and six lanes of traffic, a showpiece architectural feature connecting the campus with Sweetwater. The $14.2 million project was supposed to take advantage of a faster, cheaper and safer method of bridge-building promoted by the university. Aref and Varrastro also diverged on whether there was enough support in place at the time. "The cables are carrying the structure," he said. "If it's a cable-stayed bridge, somebody will ask the question: Why wouldn't they start with building the pylon first, so they could connect it properly?" Verrastro said these projects are constructed with "very specific sequencing" and phases. He said the lack of the central pier and cables was "no red flag at all." "This was designed to support itself - that was the beauty of the design, I'm sure," he said. "You didn't need temporary supports. It saves money. It's safer, because if you put temporary supports, you have to block the road and the traffic would be a mess and it would be in the way. So I'm sure that was all thought through." Smitha, Duran's uncle, can't help but believe that this tragedy could have been avoided.